Spacious with a great view of Mt. Adams and Underwood Cliffs, this two room house (open plan), plus bathroom, has all the amenities. Sit up bar, patio right off the great room, garden with juicy blackberry and strawberry patch. The bedroom is huge, big desk, closet. There is big tiled shower and washer/dryer in the bathroom. Located on quiet acreage on the 'cusp of the country', the studio is walking distance to three wineries (Cathedral Ridge Marchesi and Hood River Wineries) as well as hiking and mountain biking trails in the world famous Post Canyon. It is also a 6 minute trip to the Columbia River Gorge and downtown Hood River. Keywords: House, studio, getaway, view, quiet, great location, mountain biking, skiing, near downtown, winery, wineries, breweries, brewery, kite boarding, cozy, netflix, amazon prime, laundry, full kitchen, complete amenities, barbecue, BBQ, Post Canyon, Hood River, dirt biking, hiking, Mt. Hood, scenic, friendly. Alison and John Bryan moved to Hood River in 1993 from Berkeley, California with the intent of trying out small town life. The experiment was a complete success. 'Small town life suited us well and allowed us to raise two beautiful children and enjoy day upon day of the beautiful Hood River valley. Although we are slowing down, we still enjoy boating, snow skiing, kiteboarding, gardening and hiking minutes from the studio. Hood River and the Columbia Gorge offer some of the most unique seasonal recreation and activity of anywhere we have been in the US. Within 20 minutes of 'The Studio', you can enjoy world class hiking, mountain biking, windsurfing and kiteboarding, kayaking and glider flying. The Hood River valley's unique location sets it close to the city of Portland, Oregon, a major metro area, but also protects its unique beauty and its future with geographic location and the National Scenic Act, which limits development. Hood River and the Gorge will have that 'small town' feel for a long time to come. Small town means friendly people, who bend over backwards to offer you help, advice, and encouragement for whatever your travel goals might be. Small town means no traffic jams, lots of bicycle traffic, walking and local fare. Should you take the day off from windsurfing, kiteboarding or any of the numerous recreational offerings, there's always a winery to visit (5 minute walk to one) or local street parties, farmers' markets, craft fairs and plenty of nightly music and restaurants to visit. One, with tiled standup shower. Looking out at Mount Adams and the Underwood Cliffs. Infloor radiant heat. Great for walking in stocking or bare feet. Designated parking spot for guests. Wifi is available at no additional cost. Please ask us for the password. We now offer high speed cable internet at 20BPS delivery. 12 cup drip as well as a french press. Coffee bean grinder is provided. Space galore for those who love to cook. 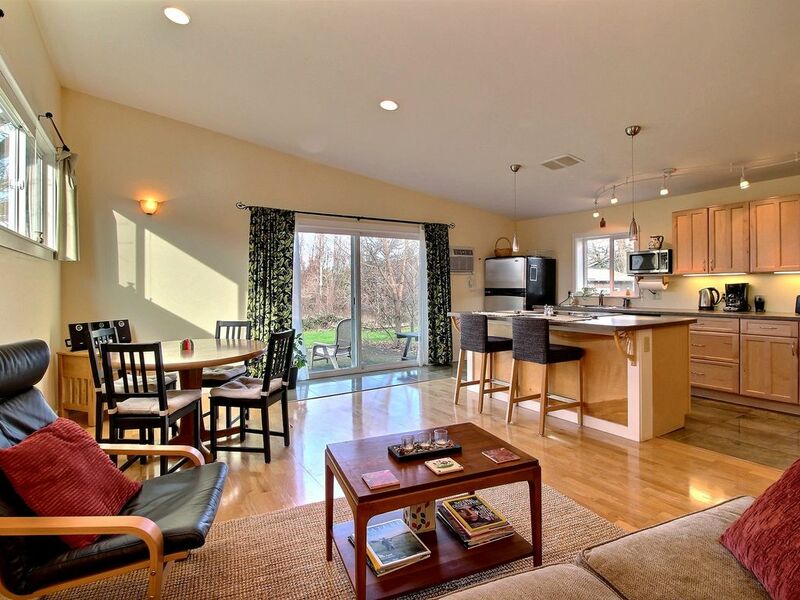 Over 25 feet of working counter space with views out the 8 foot sliding doors while you cook. A compliment of cooking utensils, pots, pans and dishes provided. 42 Inch Flat screen Plasma TV with basic Satelite, and ROKU with Streaming TV available from Netflix and Amazon. HBO and Showtime are available at no extra cost. Hiking books and local information pamphlets available. Two lounge chairs and coffee table with 2 chairs overlooking 5 acres of fields and the Underwood cliffs in the distance. Mt Hood Meadows is 45 minutes from the Studio. Timberline is about an hour. Public courses available within 2 miles. Tennis and pickleball available. Indian Creek Golf Course is just 1 1/2 miles away. Spectacular views of Mt. Hood off many of the tees. It’s away from the hustle and bustle of the city but literally 3 minutes away to drive to! My husband and I had the best time here, we even had chill days at the studio because of how cozy and ideal it was! I can not recommend this place highly enough! Every creature comfort, beautifully maintained. I really didn't want to leave at the end of my stay! The studio is spacious, well-located, quiet and private. The kitchen is also well-supplied with herbs and spices and adequate baking pans and cooking utensils. Foggy on the first day, we did see Mt Adams on the second day. In warmer weather I can see the patio area and BBQ nicely utilized. This unit has all the comforts of home and was just right for us. Thank you! Very comfortable and quiet. Since we were there for a wedding most of our plans were set. We are hoping to return sometime to explore more. My husband I had a fantastic time at John and Alice's studio. The studio was clean, had every amenity and the scenery was incredible. We are in Hood River at least once a year, and I hope to stay at the studio again soon. Highly recommended! Walking distance to three major wineries: Cathedral Ridge (2007 Winery of the year), Marchesi, and Hood River Wineries. Bike directly to Post Canyon mountain bike trails and expert courses. It's the country with the location of the city. 2 miles outside of downtown Hood River. 45 day advance cancelation notice for a full deposit refund. 30-45 day notice is 50% of deposit as a penalty. Less than 30 days is a forfeit of deposit. After 50% reservation deposit final payment is due upon arrival. Additional guest fees of $30 per night apply to more than two people staying at the Studio. Guests with prior permission only.